Super easy no-bake bars with a chocolate crumb base topped with a custard icing layer all topped off with a chocolate ganache topping! 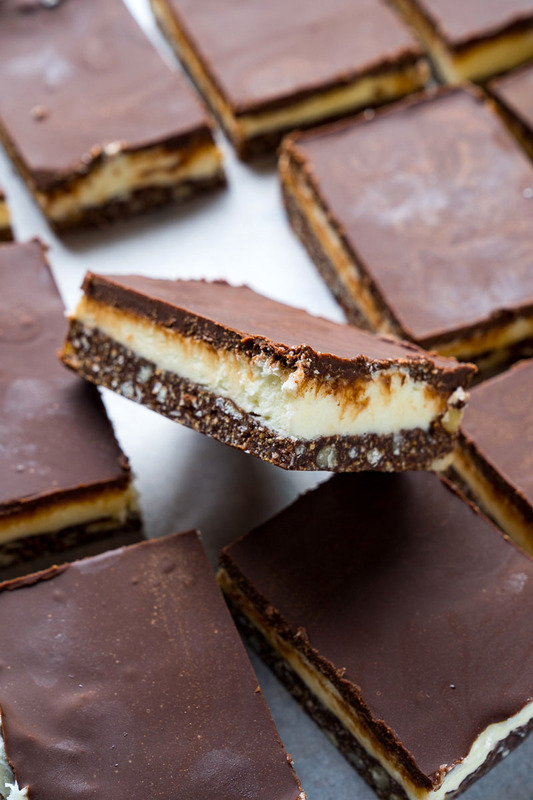 When I was growing up both my grandmother and my mother always had cookie platters around for the holidays and one of the staples, and my favourites, are these nanaimo bars. 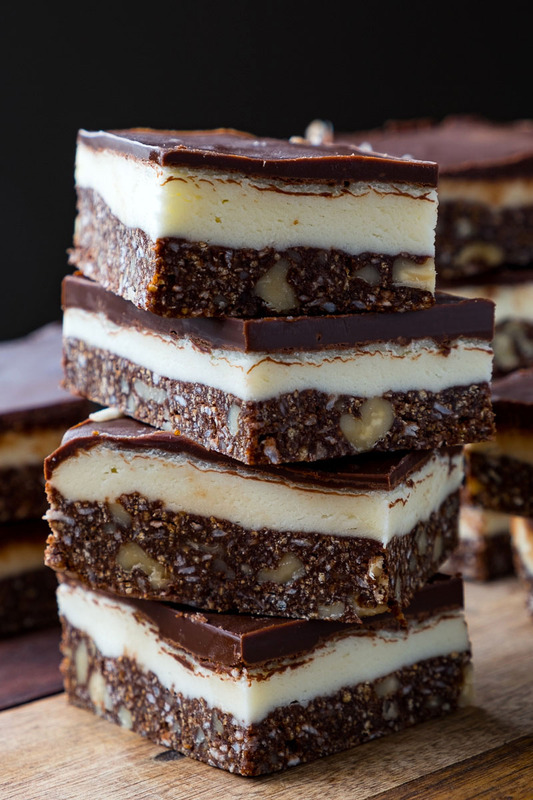 Nanaimo bars are a dessert bars with layers of chocolate crumbs, custard icing and a chocolate ganache that are of Canadian origin. These bars are super easy to make! In fact they are no-bake, simply requiring melting a few ingredients on the stove top before assembling and chilling. The base is made with cookie crumbs mixed with chocolate, coconut and walnuts, which is a fabulous flavour combo! The next layer is a butter icing with custard powder mixed in, though vanilla pudding powder can also be used. The top layer is a chocolate ganache, which is basically just chocolate melted into a bit of butter, that is poured over the top before being chilled back into a solid so that the bars can be sliced. 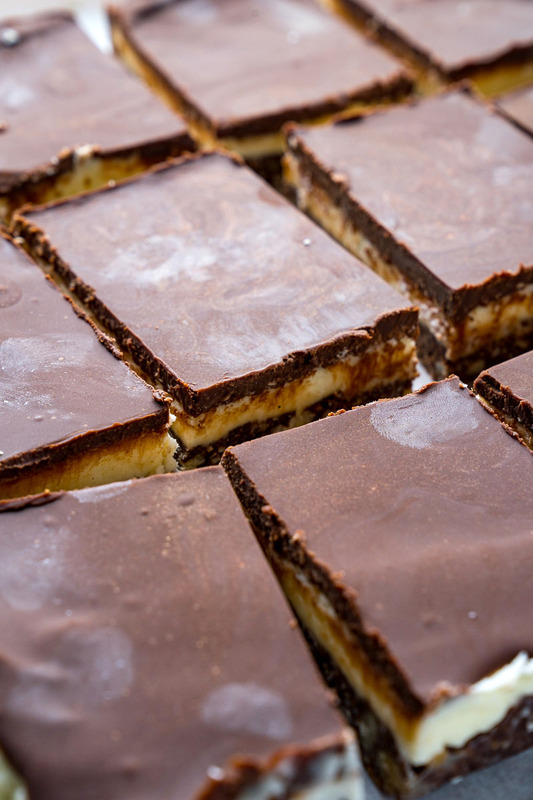 Today I continue to make these amazing nanaimo bars every year for my holiday cookie platter! Melt the butter in a sauce pan over medium heat, stir in the sugar and cocoa powder until smooth, remove from heat and whisk in the egg and vanilla extract. Stir the graham cracker crumbs, coconut and walnuts into the sauce and press into the bottom of a greased 8 inch square pan, before chilling for 20 minutes. Meanwhile, cream the butter before beating in the the custard powder and milk, followed by the sugar, one cup at a time, and spreading it over the chocolate base and chilling in the fridge for 20 minutes. Melt the chocolate and butter in a pan over medium-low heat and stir until smooth before pouring over the filling layer and chill in a fridge until the chocolate begins to harden. Score the chocolate where you will cut it into bars and chill in the fridge and before the chocolate completely hardens, cut into bars. Option: Omit the walnuts or replace with another nut like pecans. Option: Add a flavour, like mint, mocha, peanut butter, to the custard filling! Oh my, those are beautiful. I’ve never heard of these before…they look so professional! And they do look professional – really beautiful! These look beautiful! I love how straight and neat the edges are! Bet these taste fabulous too! Double thumbs up!!! They look like they came from a good bakery. I love the one with Crème de Menthe in the middle also. How funny! I have been thinking about Nanaimo bars for a week now, probably because I will be in BC next week and will have some for sure. I remember one layer being a litte more yellow though…Don’t know why. Yours look good, enjoy it! Honestly kevin,why are you torturing me with the delicious beauty ? Its seriously tempting..
I’ve never heard of these. They sound like fun! OH MY GOD, I love those things, havent had one for years and years! I must make them and yours look perfect! This looks great! The combo of flavors sound so good. I bet a mint version would be great. Very interesting name for bars, I honestly never heard it before. They are delicious. BTW, people often ask how Nanaimo is pronounced. It is like this … Nuh-Nie-Moe. It’s the name of a city in western Canada. There are variations on this (different flavours), but the original recipe is still the best, IMO. Wow! For your first time in making these bars, they sure look excellent. I love this blog by the way. From one Canadian to another. I’m such a sucker for nanaimo bars! The only time I ever made them was out of a box (with the bright green mint custard filling), but now I don’t have to wait until I go home for these. Bookmarked! I made Nanaimo bars for the first time last year–turned them into a cheesecake bar, and everyone at the office went NUTS! Yours looks amazing with that thick crust! It’s the best part. simply delish Kevin. There is something similar here in Germany too but they are not chilled. This sounds even better! 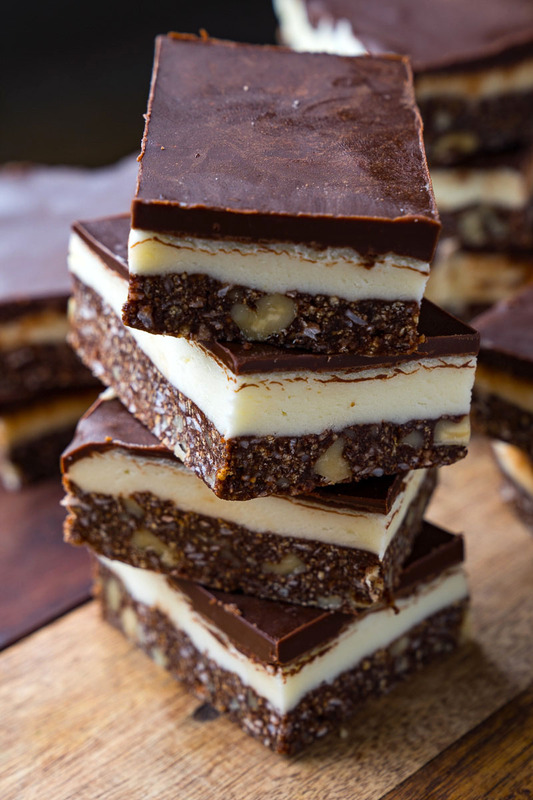 Nanaimo bars are one of faves too…gotta have them during Christmas. I haven’t heard of these before but they do look good! What’s with the sweet tooth Kev? This is so unlike you! I would not mind having a few of these bars in my fridge! Delicious!!! These look perfect. They really are my favorite christmas bar. Truly these are my favorite dessert! I loved them as a kid growing up and I love them even more today. Yours look like they turned out great. Never had those! Sounds absolutely perfect! I’ll give them a try definitely! I’ve always wondered about the origin of the Nanaimo bar. Any ideas? mmmm, these are one of my favourites. a lot of your recipes have made it into this year’s family christmas eve dinner. sadly these will not, but i’m drooling on the keyboard anyways. They look wonderful….Once again, everything you make looks wonderful!!!! Beautiful Kevin..just perfect. I 'unbelievingly' did a recce of the list of ingredients & found these very 'doable', cosidering the lack of ingredients in out part of the world. A few small substitutes…& I shall be singing nanaimos! Have a great holiday season! I lost my Nanimo Bar recipe and here it is, right here on your site. Thanks for sharing, I used to like to make these at Christmastime in the past and probably tossed my recipe with my baking mess as I cleaned up. Thanks! Oh how did you cut them to be so perfect, please share!! Pretty please! I made these last year, but the middle layer was peanut butter. They were so good. Yours look delicious! I’ve never seen these before. They look great, and I’d love to try one! Those look gorgeous and I bet they were unbelievably delicious! Never tried these, but I am sure I would love them! These look terrific! I do love a good chocolate! Looks good…and I love the “clean knife” cut you did! These look great, and worth whatever effort they took to make (chilling the layers)! oh wow Kevin!!! very lovely…you always make the food look as good as it tastes!!! I am snowed in and baking up a storm in the kitchen today…. I loooove Naniamo bars! My boyfriend’s mom makes mint ones every Christmas. They are delicious! Oooh, these look great. I like the idea of eating the bars cold, too. YUM! Mmm, I love them out of the freezer. My Canadian mother-in-law makes them every year at the holidays. Yum. FANTASTIC! I’m making these bars with my darling boyfriend’s Canadian mother next week. I had no idea what they looked like. Now I’m even more excited! Lovely Kevin! Those look great, Kevin! My husband wanted me to make some of these, maybe I’ll give them a try now. Yours look fantastic! Oh my Gosh YUM! I’m drooling right now! i haven’t had nanaimo bars in years! these look great. One of the most beautiful desserts I hav ever seen. I’ve always wanted to make these, and these look particularly delicious, Kevin! yum! impressive, i love the layers! My mom used to make these! But i have a question. What is icing sugar? Is it just powdered sugar? 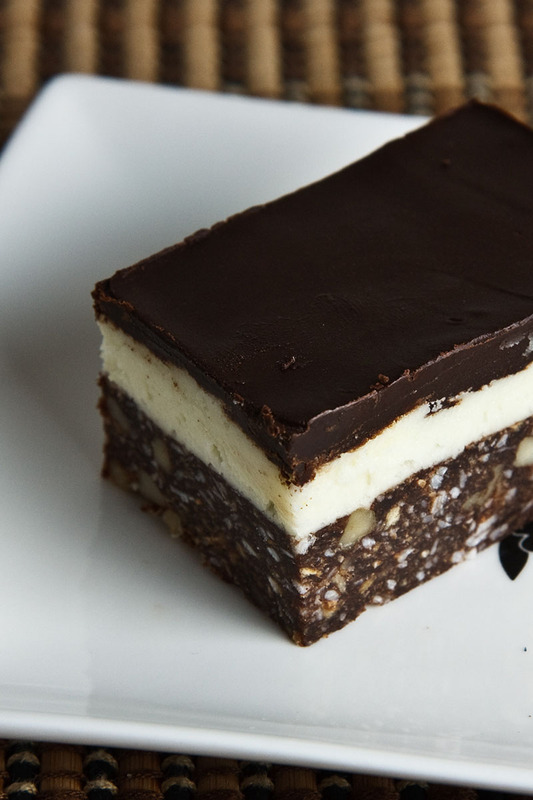 These are the most beautiful nanaimo bars I have ever seen. Literally, they look gourmet. Lydia (The Perfect Pantry): According to the wikipedia entry Nanaimo bars original from Nanaimo, British Columbia. Robin Sue: After the bars finished chilling in the fridge I cut them with a knife that I ran under the hot water tap and wiped the blade clean after each cut. Shannon and Scott: Icing sugar is powdered sugar. I have missed many of your excellent posts and dishes. Do forgive me. I have never heard of these treats, but they look and sound fab. This is so nicely done you can already sell it Kevin! what a perfect slice of deliciousness–nicely done, kevin! Gorgeous and tasty, I am sure. Love these bars! Now that’s really scrumptious Kevin. U never heard of Nanaimo Bars, not even from my Canadian neighbour! Very well executed cut and the photography is so tempting. You know what, I may just try your recipe and surprise my neighbour 😀 Thank you for the recipe. These look wonderful with the different layers and the mint sounds great.. holiday party dessert idea filled. Thanks! i’ve never heard of these but the picture instantly caught my attention…yum! YUMMO!! A Canadian Christmas given!!! I always made Nanaimo bars at Christmas for on my baking trays. Yours look fabulous! you take super pics and this has been on my to do list for months… never enough time to gobble it all up! your profile pic is great, mykonos? I love desserts where you can see the distinct layers. Your slices came out perfect, too! 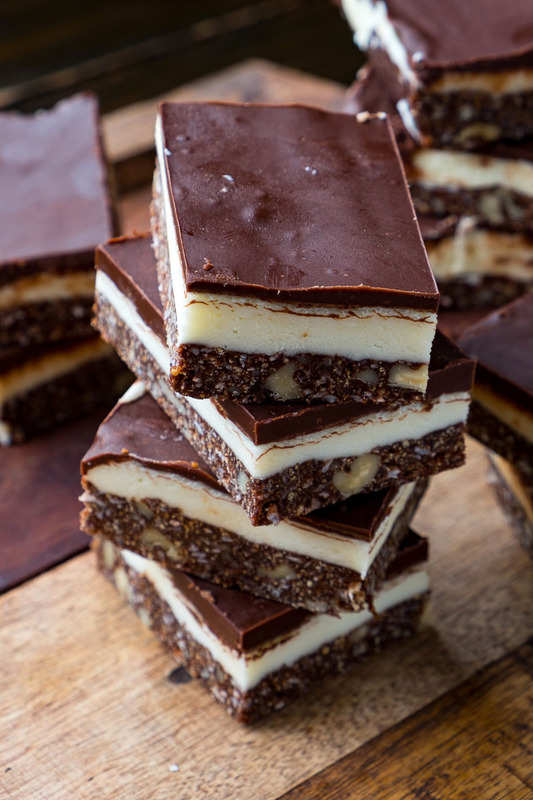 Kevin, I’ve never left a msg before but I’m an avid reader:) Your Nanaimo bars have tempted me to make a batch – this is the first I’ve heard of them – but I am taking them home for X-mas, I think my family will love them. Thanks! Kevin- Thanks for the cutting tip! I love nanaimo bars. I use to date a girl (from Canada, no less) that introduced me to these. You’ve inspired me to make this again. Thanks Kevin! I’ve never heard of these before, but I don’t see how you can go wrong with these flavours. Beautiful! once in a blue moon…: Close, the profile pic was taken in Santorini. I am not waiting until next Christmas to make these wonderful looking bars!! Mmmm… What a georgeous recipe ! These look so cute, so perfect ! Thanks ! my compliments Kevin, you are very… bravo!!! I discovered your blog recently and I really like it! I’ll make these bars, you can show me how I can change graham cracker crumbs here in Italy we don’t know them. lacucinadimarble: I think that vanilla wafers would work just as well. finally I made these bars, not beautiful like yours, but very good!!! These look so amazing Kevin. I want to make some for a family function that is coming up and I got to tell you- yours look incredible. I was completely shocked when i saw the pic, I had to click on it!! They look good in a lustful way! I’ve found today your blog and it looks amazing, I love to start savouring food from the beautiful pictures. I just found your blog through Marie at A Year From Oak Cottage. Wow! You have some incredible looking recipes! Where did you learn to cook? Do I need to do any measurement converting to make these in the US? Come visit The Rabbit Hole anytime. I have occasional recipes but mostly just fun this and that. Allison: I am mostly self taught as far as cooking goes. You do not need to do any measurement converting, just use the recipe as is. Let me know how they turn out. My mom always made these as part of her Christmas baking. The secret is to use Bird's custard powder or it won't taste/look right. Kevin, did you use sweetened or unsweetened flaked coconut? Also, I've tried making these once and my crust did not come out as thick as your beautiful picture….did you use a smaller pan than mentioned in the recipe? Thanks for your advice! Lynn: You could go with either. The bars are pretty sweet as it is so it is just a matter of how sweet you want them. It doesn't make sense to eat uncoocked raw egs. I'd like to have your comment. Anonymous: In this recipe you are whisking the egg into the contents of a hot pan while whisking to prevent it from turning into scrambled eggs. You remove the pan from the heat as soon as you add the egg but there will be enough heat to render it safe. Your photo shows a white filling rather than the usual pale yellow of the Bird's custard powder which I am not that keen on…what did you use in place to make it white? I might just have to try these again! Thanks very much, and you have a wonderful site! beautiful..i made these once a long time back ..but they were sad:( Yours look stunning! I definitely couldn't find custard powder at my grocery. Should the vanilla pudding powder be the cooking-kind or the instant-kind? Rin: Go with the instant vanilla pudding. Kevin, I must say I love your blog. You have a beautiful layout and the recipes look great. This particular recipe seems to be the same one my mother used to make at Christmas. They had a different name but it looks to be the same recipe. These were terrific and I had forgotten about them. Thanks for the reminder as I loved these bars!! I read your blog all the time but this is the 1st time I've been compelled to comment. My gal pals & I used to take a yearly pilgrimage from our homes in NE to Nova Scotia via the Scotia Prince. The 1st thing we would do is race up the ship & search for these bars! Thanks for the nostalgia, and all of your very talented recipes! These look delicious. Im just a kid and im already cooking. I always wanted to find something for Christmas Dinner Dessert and now I have. Thanks for a great dessert blog post. Can't wait tell you post more blog posts. I have Sent you my ULR. These were fabulous! I have celiac so I used gluten-free graham cracker crumbs and they were delicious and looked just like yours. Planning on taking them to my daughter's house for Christmas, if my husband and I don't eat them all in the meantime. Thanks! I'm trying out this recipe with Pastry Cream as the custard filling (I'm a Patisserie student at Le Cordon Bleu). I'll let you know how it turns out! I love Nanaimo Bars! Wow these are awesome! Thanks for another great recipe. So glad I found your post for Maple Pots de Creme. Those are my all time favorite dessert! nanaimo bars are my mst have at christmas time. i've been converting all my american friends into nanaimo lovers too. i was just going to suggest that next year you try with chocolate graham cracker crust. that''s how my mom ad i make them and theres really no way to go wrong with more chocolate! When I made mine, I mixed the middle layer with a few tablespoons of peanut butter – YUM!! Kevin: I love Nanaimo bars! Nanaimo bars are one of the greatest contributions from Canada. Love 'em. Wendy: I am not sure if graham crackers are available in Australia but if you cannot find them then pretty much any plain cookie like vanilla wafers or digestive biscuits will work with the cocoa or you could even use chocolate cookies, like the tops of Oreos, without the cocoa. My great grandmother was from Canada and though my grandmother wasn't much of a cook or baker, she always made Nanaimo Bars (which we just call "Nanaimos"). My kids (now in their 20s) love these and demand them every Christmas. Someone commented about the hazard of using raw egg on the bottom layer. If this bothers you, get some pasteurized frozen egg and use that instead. Someone else mentioned pastry cream as a substitute for the custard filling, but I don't think that will work. Pastry cream is too soft. The middle layer of the Nanaimo Bars is quite firm. For those who can't find graham crackers for the bottom layer, I agree that digestives or vanilla wafers or Marie biscuits will work. Any plain, slightly sweet cookie/biscuit. Kevin, did you end up trying any other versions? As the first American generation in my Canadian family I've had only this original style since I didnt have them often & I love them! However, I developed an allergy to coconut (my all-time favorite flavor) at 18, and have not been able to have these for over 10 years. I'd truly appreciate some ideas as to what I can use in the bottom layer instead. Thanks for all you crave!!! Becca: I am really into coconut so I have not tried a version without. You could easily just skip the coconut and use the recipe as it is without. I was recently thinking about trying a version with rolled oats or maybe even quinoa. For those who don't have graham crackers available for the bottom layer: I agree that Kevin's suggestion of vanilla wafers would work, but the closest substitute of all is Digestive Biscuits. And I believe the second best would be Marie Biscuits. If I couldn't find either of those I'd probably settle for vanilla wafers. Okay I have bookmarked this one. I have been making this exact recipe for a few years now. Every Christmas the first thing my brother-in-law asks is if I made nanaimo bars. I got it in a recipe book that I received as a gift. It is really good. This is THE recipe! Wow looks so awesome! Can't wait to taste them! Kevin, this recipe looks delicious and calls out to my chocolate love! I love the idea that you can freeze them. What a great dessert idea! The recipe says to use custard powder but vanilla pudding powder can be substituted instead. Does that mean vanilla pudding that has to be cooked or the instant vanilla pudding. I am from New Mexico and have never heard of custard powder nor have I ever seen it at the store. Yes, instant vanilla pudding powder (just the powder, uncooked) can be used instead of the instant custard powder. Enjoy! Do you put an uncooked egg in the base? The egg goes into the just melted sauce which ‘cooks’ it before it is added to the dry ingredients to form the base.